Among the Muslim respondents in the survey, most endorse a woman’s right to decide whether to wear a veil, including more than 80% of Muslims in Turkey, Indonesia, and Lebanon. Still, sizeable minorities of Muslims in several countries – and a majority in Nigeria – disagree with this view. In several countries, women are more likely than men to believe these decisions should be made by individual women. Majorities in five of the eight Muslim publics included on the survey reject restrictions on men and women being employed in the same workplace. And support for such restrictions has declined in several countries over the last year. Still, most Jordanian and Egyptian Muslims favor workplace restrictions. Wearing the Veil: Who Should Decide? 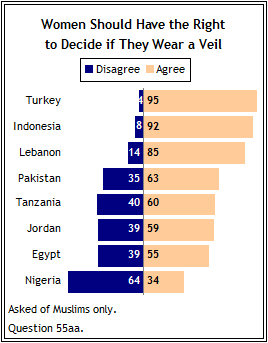 Majorities in seven of eight Muslims publics agree with the statement “Women should have the right to decide if they wear a veil.” This view is most widespread in Turkey, Indonesia and Lebanon. Nearly all of (95%) Muslims surveyed in Turkey – where the country’s highest court recently upheld a ban on women wearing a head scarf in government buildings – feel that women should be able to decide whether to wear a veil. About nine-in-ten (92%) Muslims take this view in Indonesia, where in recent years several local governments have issued laws requiring women to wear head scarves. In Lebanon, 85% agree that women should determine whether to wear a veil, including overwhelming majorities of both Sunni (91%) and Shia (79%) Muslims. Solid majorities of Muslims in Pakistan, Tanzania, Jordan and Egypt also agree that women should have the right to decide on this issue, although more than one-in-three in each of these countries disagrees with this view. 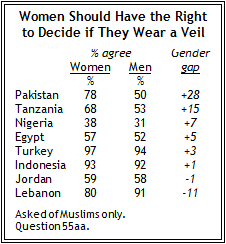 Nigeria is the only country in which most Muslims (64%) oppose a woman’s right to decide whether to wear the veil. Currently, only about one-in-three (34%) Nigerian Muslims believe women should be allowed to make this decision, down substantially from last year, when roughly half (51%) felt this way. Support for a woman’s right to choose on this issue has also declined somewhat since last year in Tanzania (-8 percentage points), Pakistan (-7) and Egypt (-5). In several nations, women are generally more likely than men to believe wearing a veil should be a woman’s choice. This is especially true in Pakistan, where 78% of women take this view, compared with 50% of men. The divide between men and women also is pronounced in Tanzania – 68% of Tanzanian women support a woman’s right to choose whether to wear a veil, while 53% of men hold this view. Lebanon is the only country in which Muslim men are more likely to believe women should have the right to decide, although this view is widespread among both Lebanese men (91%) and women (80%). Majorities in five of the eight Muslim publics surveyed oppose restrictions on women and men working together. Large majorities in Turkey, Tanzania, Indonesia, Lebanon and Nigeria disagree with the statement “There should be restrictions on men and women being employed in the same workplace.” However, most Muslims in Jordan and Egypt favor such restrictions. Pakistani Muslims are evenly divided on this question (49% agree, 49% disagree). In several countries, Muslims are less inclined to support restrictions on men and women in the workplace now then one year ago. In the current poll, 39% of Nigerian Muslims favor restrictions, down from 53% in 2007. Just 11% in Turkey back restrictions, down from 24% last year. Similar declines have taken place in Pakistan (-12 percentage points) and Lebanon (-9). The gender gap on this question tends to be smaller than on the veil issue, although women are significantly more likely to oppose workplace restrictions in three countries: Jordan, Egypt, and Tanzania. About half (49%) of Jordanian Muslim women oppose these restrictions, compared with just 30% of Muslim men. The gap between Muslim women (48%) and men (34%) in Egypt is only slightly less pronounced. Both Tanzanian women (83%) and men (70%) overwhelmingly oppose workplace restrictions. In Lebanon, there are also significant differences along sectarian lines. While Lebanese Sunni Muslims are somewhat split on the need for restrictions in the workplace (45% support, 54% oppose), Shia Muslims largely oppose such restrictions (18% agree, 78% disagree).